The president said he would prefer to "cry and sit there"
President Obama has a reputation for delivering speeches that have brought crowds to tears, but there's one speech he has admitted would make him cry if he agreed to give it. The father of two says he won't be delivering the commencement address at the upcoming high school graduation for his oldest daughter, Malia Obama, because he'll be too overcome with emotion. He told lunch guests at an event in Detroit Wednesday he would prefer to "cry and sit there" with the other parents in the audience. The president explained he'll be fighting back tears when he watches his 17-year-old daughter move on to the next phase of her life, so all that he'll be able to focus on is keeping his composure. 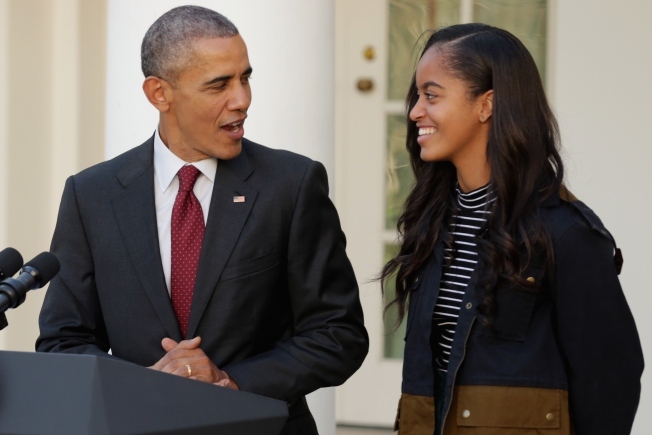 Malia is finishing her senior year at the private Sidwell Friends School in Washington, D.C. The first daughter is expected to attend college in the fall. She has visited at least a dozen public and private schools including the University of California,Berkeley; New York University; University of Pennsylvania and Yale.